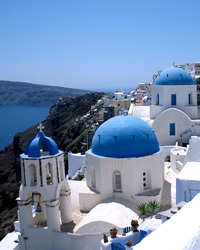 Greece is producing excellent wine, and its whites are particularly good. Here, Ray Isle spotlights 11 noteworthy bottles. This zippy white, a fragrant blend of two Greek grapes from one of Santorini’s top producers, has aromas of green apples and lemon blossoms. It finishes on a bright citrus-zest note. Boutari is one of Greece’s largest wine producers—and also one of its best. In 2007, its inviting Moscofilero bottling is characteristic of the variety: brisk and abundant with blossom and spice notes. A blend of the white grape varieties Moscofilero and Roditis, from an ambitious winery in Neméa, this savory bottling is all about elegant floral and spice notes, such as lemon blossoms, rose petals and sandalwood. 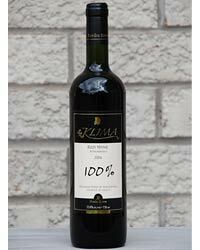 GAI’A, founded in 1994, focuses on native Greek grape varieties. Among the most appealing of its many wines is this affordable blend of Roditis and Moscofilero, aged in stainless steel tanks; it offers mouthwatering acidity and crisp lemon-lime flavors. Oenoforos was founded in 1990 by Angelos Rouvalis, a young, Greek-born, Bordeaux-trained winemaker. Winds off the Gulf of Corinth cool the winery’s hillside vineyards, producing wines like this lemony, earthy white. 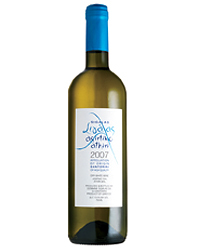 Honeysuckle and mandarin-orange aromas characterize this white from the island of Rhodes. It’s made from grapes grown in a group of small vineyards on the northwest slopes of Mount Atáviros, high above the Aegean. Founded in the early 1900s, Estate Argyros is one of the most significant wineries on Santorini. Its affordable Atlantis white is a great introduction to the strengths of the Assyrtiko grape—the lemon-honey aromas, mineral intensity and citrus-zest notes that distinguish it as a great seafood wine. Winemaker Harry Hatzidakis blends small percentages of the Athiri and Aidini grapes with Assyrtiko for this lemony white. More full-bodied than most Santorini whites, its flavors last, ending on pepper and chalk notes. Santorini’s volcanic soils and windswept vineyards combine to create thrilling white wines like this one. It’s marked by the scent of seashells and lemon zest, and despite its light body has a surprisingly silky texture. This aromatic white is the color of 12-karat gold and ought to be priced as such (thankfully, it isn’t). Evangelos Gerovassiliou rescued the near-forgotten Malagousia grape, replanting it at his estate in northern Greece to make this complex, mouth-filling wine. It’s an addictive mingling of melon, spice and minerals. One of the new wave of Greek winemakers, Yiannis Vatistas produces a broad range of high-quality wines from his base near Monemvasia in the Peloponnese. This fragrant white is one of his best: creamy and dense with peach and lime fruit, ending on dry spice.